Afternoon Loverlies! Yesh!! 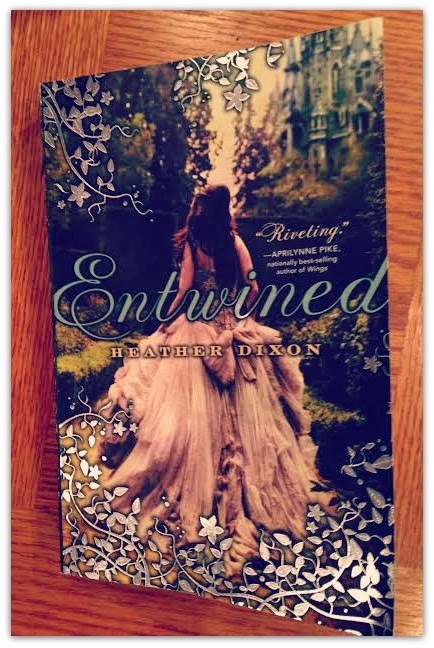 I have finally finished Entwined by Heather Dixon. This book was beautiful. lol I don't know how else to say it. It's a perfect fairy tale book. I love it so much. I wish and hope they make it a movie. This book is about 12 sisters that are princesses. Their mother and father are of course king and queen. lol The mother is ill and with child, the twelfth sister. Alright, I'm about to give away a little bit of the beginning. You probably already guessed it, the mother passes away. After the mother passes they have to go into mourning. That is where they close all the drapes. They have to wear black dresses and cannot do any dancing or anything cheerful. The princesses are not fond of this. They enjoy dancing because it helps them remember their mother. The palace is magical. There was a High King D'eathe that lived before them that was magical and would kill and trap souls. He of course was very evil. One of the kings before the recent king, was able to trap the high king in the palace. The princesses find a passageway that is supposed to be a storage area the king uses. To open the passageway you need something that is of silver. They decided to go there every night to dance. There is a man there with black eyes called the keeper. He is able to bring music and treats for them to eat and dance to. This keeper, he very much likes to keep things. There is so much more to this book. But I hate to write more about it. I'd rather you read it for yourself, because it is extremely worth it. I enjoyed this book immensely. Ta Ta For Now!